This is my last card for the Card Chain Challenge for this year. I will be visiting my Dad in California for the holidays, and all my card making stuff is in Maryland. I'll be scrapbooking in California - lots to catch up on. I decided to go with Deborah's colors and sketch and the theme of gratitude. Three of the 5 options available this month. I started with a kraft card base, and added my layer of patterned "taupe" paper with a die cut circle. Leaves were added in a glittered gold, and deep red. The circle die used was from MFT, the leaves were from Lawn Fawn, and the sentiment banner from SSS. The sentiment is from a Taylored Expressions set, and it was heat embossed in old gold embossing powder from Stampendous. Its fun to get a hand made card in the mail, and fun to send one out to someone new! Another birthday card, I have a bout 7 birthdays in a 3 week period between the end of November and mid December. It is always a mad rush to get them all finished amid the rush of finishing my Christmas cards. I received the embossing folder (Darice) I used here from sweet Greta, I intended to use it on my Thanksgiving cards, but I made just a few, and my mojo was lacking. However, it is perfect for this fall birthday card. I had a watercolor piece that was fall-ish in colors, and I found a card base that would work well too. Birthdays need a bit of glitz as well, so some glitter paper was added to the pile. As a contrast to the glitter, I added some twine and wood veneer leaves. I kinda like the differences between the wood and the sparkle. I adore this large sentiment from the Make a wish set by Mama Elephant. There is no guessing the occasion for this card. I used the largest circle from MFT's stitched circle dies for my center piece. I made just a few cards for Thanksgiving, this year. I am still quite happily playing with my water colors. They are definitely one of my favorite mediums for creating backgrounds. It is always a mystery how they will turn out, and more often than not, they look much better dry than wet. I think I have tossed out only about 5 out of a whole bunch...and only because my color choices turned to mud when blended. Otherwise I have been happy with the results. This card used a few scraps of paper, and a watercolored background. I used Mama Elephant's stamp set Make a Wish for the greeting and heat embossed it in white. I love blues purples and greens together. I started with a piece of water color paper (Canson 140 lb weight cold pressed) with the smooth side facing up. I tape it to an acrylic cutting board. Next I spritzed it with water from a mister, and then added a bit more water with a wet brush. Next comes my base color, the one I want most of on the piece. I just splotch it around. You can see the water moves the color, because the card is fairly wet. Next, I load a rounded brush with wet color, drippy wet and flick it on the sheet by tapping the brush. You can see how it spreads after it lands. I did this with the purple and green. Lastly, I lightly respritz the sheet with water to get some more blending. Once this was dry, I added some gold Heidi Swap Color Shine. Again, just flicking the bottle end of the sprayer over the paper. Once that too was dry, I added my sentiment and heat embossed it in white. Lastly it was all layered together with a few strips of cardstock scrap and a bit of gold string. I was so glad I was able to play in this scramble today. I was working on a mail project for hubs and wasn't sure I would get to scramble, but I joined the scramble about 20 minutes in. For the first time ever in a scramble my card came together with out any major glitches. Whoo Hoo! Tesa's theme was SNOW. I first stamped, heat embossed and die cut my snow flakes. Next I pulled a white panel and partially die cut my snow man. I taped the die down, and taped the paper down---this saved me a lot of time. After cutting my snowman partially out, I laid down the circle die around him, and did not move the paper a bit because I was hurrying- I didn't take it off the cutting plate to inspect it ---Guess what --- a perfect cut, I didn't have to do any clean up with craft knife to get the circle edges to line up with the snowman's body. Since all was going so well, next I stamped the snowman, using a Stamp-a-ma-jig. The stamp is a cling stamp and would be difficult to position otherwise. I could have stamped it first then made my die cuts, but this worked out so much better for me. I colored in the scarf, nose, and added some shading to the snowman with Copic markers. Next I added some distress inks around the snowman, using Tumbled Glass and Stormy Skiy to get a swirly feel. I wanted it darker around the edges of the circle. My sentiment was from Stampin Up, and the banner stitching from Simon Says Stamp both were heat embossed. I fussy cut the sentiment, because the die is solid, and I can't see where I would be cutting. Normally I would cut it out first, then stamp and emboss. Lastly, a quick little red bow tied and stuck on with a glue dot. I then adhered the front panel to a black card base with foam adhesive. Was about an hour from start to finish, to get this card made. My last post almost a week ago featured this same stamp set. I was a little mind blocked using the Holly stamp. Several readers offered some suggestions, so I took another run at the stamp. One stamp of the holly branch was just too bare, so I tried 2 stamps, then die cut the image leaving only 2 partial branch stampings. I am much happier with this configuration. I created a mat frame around it, used some distress inks to add some blue color, and red stickles to enhance the berries. Before adding the stickles, I heat embossed with clear the entire front panel. It gives a nice effect IRL. I placed this panel on a dry embossed panel of holly leaves before placing on the card base, and lastly added the SSS Merry Christmas die stacked 3 times. It is a definite improvement over my last try with this set. I did a bad thing, I bought this stamp purely for the pine branch and pine cones. One should not do that...I can't think of a thing to do with the holly branch, I even googled...no inspiration. But I do love the pine branch. The stamp set is an exclusive from Simon Says Stamp with Clearly Besotted. It was part of their Stamptember release. I used Leaf Green and Lipstick red Simon inks for the first card, and Hero Arts Field Greens and Cup O Joe for the second and third cards. I also used versa mark for embossing the sentiments. I love this stamp, the pine cones are separate from the branch and come as a single and as a cluster of two. This one is the favorite of the three for hubs, I am not sure why...must be a balance thing. He is a Libra. 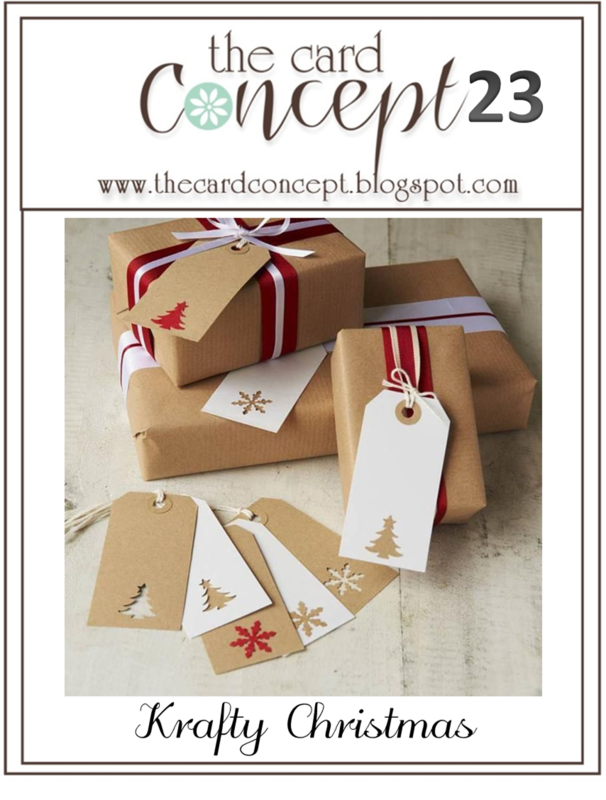 I have two cards for you today, both featuring Kraft paper and embossing paste. I so love using stencils and embossing paste. I am entering these two cards into 3 challenges - both cards into the Simon Says Stamp Flickr group challenge #5 Embossing. That challenge is open until Thursday, 9:00am EST November 13, 2014. I am also entering each card into a separate challenge. My first card is for the challenge Muse - 93, it has been a while since I have been able to play. I love inverting the colors on the Muse challenge, and this time I did much the same. The inspiration card is provided by Muse Therese Calvird. I love her clean lines. I used white embossing paste on a Simon Says Stamp Stencil from the Four Trees Stencil set # SSST121363. I added 3 sequins across the bottom added a Happy Holidays sentiment from the Simon set called Holly Berries, then added a hand-drawn white frame. I then matted it on three sides to the card base. My second was made for the Card Concept Challenge. This challenge is called A Krafty Christmas. The challenge is open until Monday, November 24th at Noon (PST). On this card I used the ever popular Falling Snow stencil from Simon Says Stamp, another of the Trees from the Four Trees stencil set and the Merry Christmas die. I used embossing paste, glitter and stickles to create the tree on a hand cut tag. I added white dashed lines to the tag. The sentiment die cut was added to the snowy panel and then the tag. All was placed on a white card base. I am calling it clean and layered in styling. I actually missed the challenge date...somehow I did not look at the date that the challenge closed. 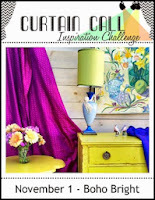 It was for the Nov 1 Curtain Call Inspiration Challenge which closed the 10th. I made the card the 11th. The inspiration photo has lovely bright colors- purple, blue and a yellow. I also liked that wood plank wall and the bits of old metal on the drawer and the lamp. I wish I had put the idea in my head to paper before the challenge closed, though. Still, I love the card so I am sharing it with you. It took several tries to get that watercolor panel the way I wanted it. I chose to put the blue in the middle as it blended well with both the purple and the yellow. Purple does not blend well with yellow---it makes brown, I have pretty trash to prove it. I am still going to post the card and it will go in my stash. I have several birthdays coming up in the next month. We had a bonus day at Online Card Classes' Holiday Card Workshop 2014 last Saturday, and the topic was coloring. I had a new stamp from WPlus9 which I thought was perfect for coloring, and just looking at the stamp makes me smile. The set is called Festive Greetings... As a child I would get so excited for the holidays as soon as my parents pulled out the decorations. I loved those (now-a-days) fat light bulbs in blue, green, red and an orange-y yellow. I felt giddy as I stamped them out and colored them with colored pencils...just generic ones I bought at Michaels and a blending pen made for wax based pencils. Some were additionally gilded with clear wink of stella and glossy accents. Others only were embellished with glossy accents alone - depending on my perception of them being lit or unlit. And I have to say I love the "sketchy" font in this set. The first card I added a piece of paper from Lawn Fawn's Snow Day paper pad, but the rest are pretty much just this stamp set. I had fun with these cards...and leaving white space is so not my comfort zone. Hi I don't seem to be able to keep up with homework...probably because I have that Simon Says Stamp Falling snow stencil in my head...not in my stash. I was going to order it last year but didn't. Now I just seem to want falling snow on my cards. I ordered it Monday in the wee hours and it arrived today! First up is my Day 4 homework, a one layer card. I followed Jennifer McGuire's example. I used a circle die from My Favorite things, and a Tree die from Hero Arts that had a matching stamp. After making my die cuts, I stamped the tree, and the sentiment. Next opening the card, I created a blue sky with Salty Ocean Distress Ink, and added some lovely falling snow with embossing paste and some Distress Glitter in Rock Candy. I loved making this card, and I anticipate making 2 or three more from my holiday card stash. Next up is day 5 homework, some tags. I rarely make tags, so this was definitely an exercise. My simple tag is simply a cut out with some patterned paper sandwiched between two tag die cuts. My second tag is a shaker tag, on reflection, it probably would be better with a colored background for the shaker bits. I filled it with glass glitter in clear, silver micro-beads, and a few small sequins. The stamps were from Stampin Up and Simon Says Stamps. The die cut is from Hero Arts, and the twine is Lawn Fawn. Late tonight I sat down and tried some water coloring homework for the online card classes I am taking. I recently purchased the Seasonally Scattered stamp set from Stampin Up. There is a "Merry" surrounded by scattered snowflake bits that I really wanted to used as the centerpiece for this watercolor project. The card in my head is SO much different from the cards I am showing you. I did not like the water color panels I made...several of them. I couldn't bear to toss them out though. Finally I die cut with a Spellbinders Label die the portions of the watercolor that I did like. I added Simon Says Stamp Merry Christmas die cut from foiled papers, and dry embossed my card front for some added texture. Do you attempt to save pieces that might not be quite what you planned? I am a bit behind on my homework already...Today I worked on Day 2 - Interactive cards over at Online Card Classes, I also watched the videos at A Very Trendy Holiday 2.0 for shaker type cards. So, armed with the information I set about making a couple of cards. It definitely took some thinking to decide where to put each element. I used Lawn Fawn's Joy to the Woods stamp set with the matching dies. I also used a Spellbinders label die, and another Lawn Fawn die for the hills. Most images were colored with Copic markers. The ornaments on my middle card were colored with wink of stella pens and stickles. Sequins were from Lawn Fawn, A Muse, Darice, Pretty Pink Posh, and Simon Says Stamp. I was incredibly lucky to win a spot in the Online Card Classes Holiday Card Workshop 2014. I also won a spot in Catherine Pooler's A very Trendy Holiday 2.0. I definitely hit the jackpot this month. I started with OCC's day One- Easy to duplicate cards. I thought the instructors had some great ideas. I have a trio of cards made assembly line style. First I did the stenciling with embossing paste using Tim Holts' Festive stencil. I have a stack of Neenah Aspen white 120# cardstock cut and folded into card bases ready for use. While that dried I cut my die cuts, the photo frame by Lawn Fawn and the Season's Greetings by Avery Elle. I layered the greeting twice in white, then ran my Brilliance Galaxy Gold ink pad over the stacked sentiment. I then heat embossed it with clear powder. I also cut it out in red, for a shadow layer. It is very sturdy. The photo frame needed a bit of color behind it, so a red framing panel was also cut. For the background I used some patterned paper I had left from last year, American Crafts - Kringle and Co. Once the embossing paste was dry, I relaid the stencil and inked the leaves, berries and pine cones with Distress Inks in Barn Door, Vintage Photo, and Pine Needles. Everything was layered together and the card was assembled. In all it took about an hour to make the three cards. I am so excited I just started making my Christmas and Holiday Season cards. In past years I have made a single design for mailing. This year I am going to make a lot of different designs, with no more than 3 duplicates of each design. I make cards for my mailings, hubs mailings (we divide the family so he sends to his side and I to mine, he writes a Christmas letter with our goings on since I make the cards. I love a division of labor) and I also make cards for my Dad to send out. I decided to make another Triptych card. I stamped and heat embossed the Hero Arts Stunning Snowflakes stamp onto some Stampin Up cardstock. I used WOW puffy white embossing powder. It would probably stick better to a less detailed image. I heated it from the backside of the cardstock and it melted and raised up giving a bit of a rough texture. I then cut the 3 and 3/8 inch square into 1 1/8 inch strips. Each strip was edge inked with Distress Ink in Tumbled Glass. I adhered these on to a piece of 3 1/2 inch square piece of vellum. The vellum square is attached to the card with foam tape after the sentiment and tine are stamped. Next my card base was prepared with the stamped twine from the Simon Says Stamp Nautical Borders set. Its supposed to be a rope, but I think it works as stamped twine. That bow is just so cute, I think it makes the card.The sentiment comes from the Hero Arts Set Greetings for the Holiday. The sentiment and twine were stamped with Brilliance Ink in Sky Blue. I made three cards each with a different sentiment from the same set. I also made one extra card front, so I can note on the back the recipient's name and the year it was sent. If I like a particular card A LOT that will make it easier to replicate next year.